2. Anti-tampering function:When the main control panel is removed or shaken from the wall, The panel will it will emit a high-decible voice alert and auto dial the preset phone numbers at the same time. 4. Compatible with wired and wireless sensors: The panel has 99 wireless zones, 2 wired zones and 2 connection port for Electronic Board . It can use with sensors like PIR Motion Sensor, IR Beams, Smoke Detector, Gas Detector, Panic Buttons and so on. 5. Immediate Spot Alarm: The panel has built-in siren and also can work with external siren. When alarm, one of the siren will ring and they can be switched automatically. 6. Low-power alert Function: Once the backup lithium battery is in low power state or AC power has been cut, the panel will send SMS to alert the user. 7. Voice Instruction: The panel has voice instruction all the way when the user are remote control the system on phone. When alarm, the panel will alert which sensor, including Door Contacts, PIR Motion Sensors, Smoke Detector, Gas Detector and Panic Button, was triggered through voice instruction . And when you operate the system on the panel, there are voice instruction for some important operation. 8. Remote control:If the system do not alarm, the user can remote control the system to arm/disarm on phone after inputing correct password. And he can also send SMS to remote control the system to arm/disarm. 9. Back-up lithium battery: When the AC power is cut, the system can continue to work because it will turn on and backup lithium battery automatically. And when the backup Lithium battery lack of power, the panel will charge for it. 11. we use high-quality,professional,industrial GSM module to disign and make our products. 12. Listen-in Function: After input correct password, the owner can hear the spot voice clearly. And the user can remotely prolong or cut listen-in on phone. What¡äs more the user can disarm the system during listen in. 13. On the remote controller, the user can arm/disarm the system and do emergency calling. It is very convinient for the user. 15. When alarm, the system will automatically dial the the preset phone numbers. Once the alarm phone has been connected, the user can remotely arm/disarm the system on phone. 16. Intelligent control system to check that whether the user has handled and confirmed the alarm. After confirmed, the system will not dial the pone numbers. 17. DC/AC power auto switch: charging by AC power , switch to DC power if AC power cut to make system no fail. the whole system can be used to prevented against burglar,robber,fire,etc. 18. The system is compatibles with SSG Wireless Doorway Keypad. 2. Power Adaptor: AC To DV conventor. Input: AC 220( AC 110V/240V is optional, output:9VDC500mA. 6. Voice Instruction: The panel has voice instruction all the way when the user are remote control the system on phone. When alarm, the panel will alert which sensor, including Door Contacts, PIR Motion Sensors, Smoke Detector, Gas Detector and Panic Button, was triggered through voice instruction . And when you operate the system on the panel, there are voice instruction for some important operation. 1. 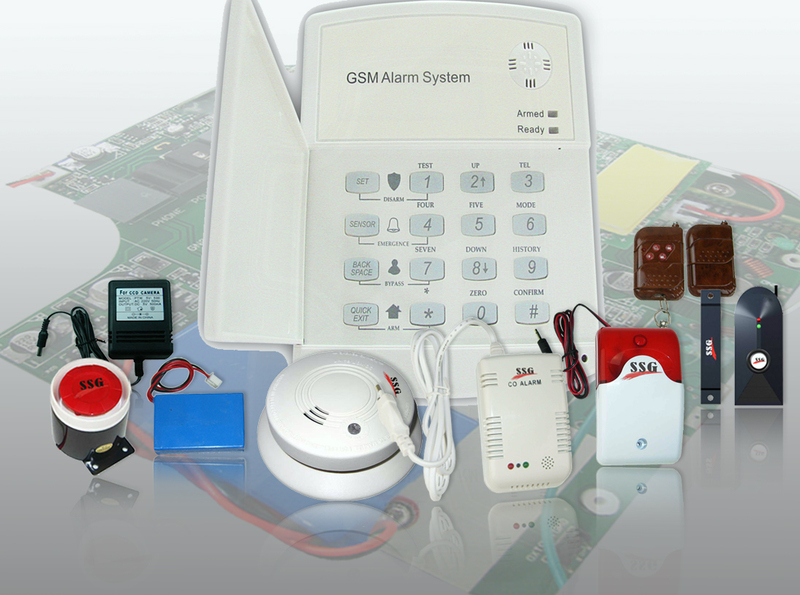 The functions of our GSM alarm system are powerful. It is one of the best sale products.